Well, June has completely failed to ‘bust out all over’, unless you count the seemingly inexhaustible cloudbursts. With all this watery weather, your wedding may be a little squelchy underfoot. But fear not, you can still step out in style. 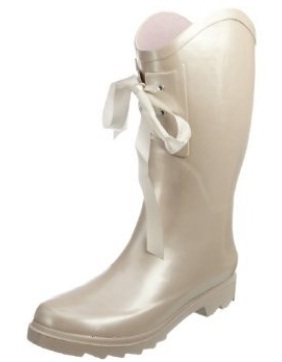 These glamorous galoshes from Weddington Boots will avoid that Farmer Giles look as you daintily dodge the downpours. Perfect for a waterproof wedding, they’re sufficiently stylish that you’ll also want to make use of them after the big day! 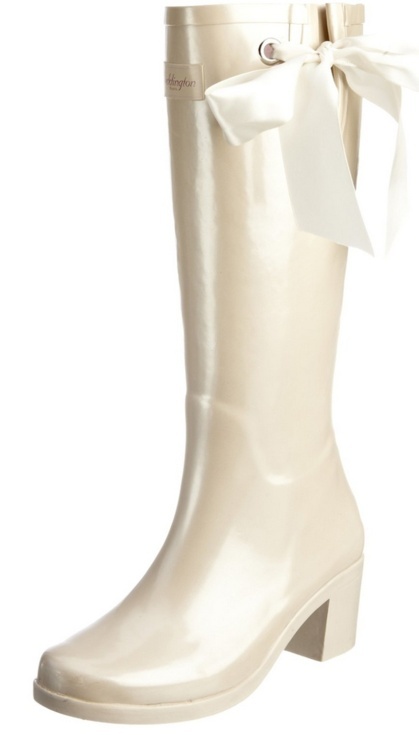 There are two designs to choose from, the Catherine Boot – inspired by Catherine Middleton’s love of knee-high boots – with its pearlescent finish, cream satin ribbon and a heel to boot (sorry!) . Or, the Classic Boot with corset lace-up detail and a cow-girl twist (perfect for that barn wedding). And if you want to take things one step beyond, then Weddington Boots can also be personalised with a different coloured ribbon to match your wedding colour scheme. You can even opt for a bespoke diamonte service! They’re wellies, Jim, but not as you knew them! See the Weddington website for further details. The boots retail at £49.99 for the Catherine Boot and £39.99 for the Classic Boot. Could a bride ever look more bootilicious? If you’ve had any personal experience with your own Weddingtons, let me know in the comments section – better still, send me a photo! Once a bouquet sells, I obviously remove it from my shop(s) and I’ve realised it seems a bit of a shame (to me if no-one else!) that it’s not ‘around’ any more – apart from anything else, I need to be able to let you see the sorts of brooch bouquets I produce. So, I have decided to ‘archive’ some of my favourites with their own page here on Get Knotted, as they set off on their travels to their new homes. Beginning with this little Scottish number. As ever, feel free to share the pics with your friends. 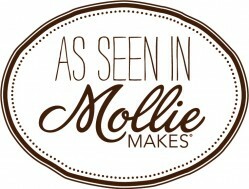 Well, what an amazing first quarter it’s been for my new venture into vintage bridal bouquets! It has been really heart-warmimg to have had such a lovely response, and surprising too – I’ve shipped my vintage brooch bouquets all over the place, including Vietnam, the U.S., Italy and Germany. I didn’t expect to ‘go global’ quite so soon! Huge thanks to all the brides who have given a home to one of my bouquets, it’s lovely to think of them off out there in the world. The Vintage Bridal Bouquet Etsy shop now has a whole fresh batch for you to choose from, with more coming soon (follow along on my brooch bouquet blog (handy if you use Tumblr), check in on the brooch bouquet page on Facebook, or keep an eye on my Twitter or Pinterest streams – I’ll be adding each new bouquet to all those as they are ‘born’, so pick whichever kind of update suits you – and let me know what you think of them, I’d love more feedback. 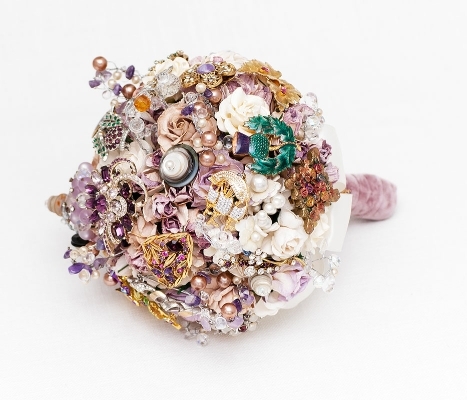 The brooch bouquet trend is gaining ever more fans and it was really flattering to be featured in the “Let’s Get Hitched” supplement that comes with the latest edition of Mollie Makes magazine, for lovers of all things handmade. The duck-egg blue number pictured in the article is still available in my Etsy shop – grab it while you can! The Vintage Wedding Fair Spring 2012 is the place to go if you are want inspiration for your wedding this year. Get Knotted is pleased to announce that we will be out on the road this spring at these exciting events in Harrogate, Chester, Leamington Spa and London with our new range of vintage bridal bouquets. The events are the brainchild of Keeley Harris, who is an expert on all things vintage and who established Discover Vintage to promote fairs across the north of England in 2009 selling everything from quality clothes, shoes, handbags, jewellery, homeware and furniture. Keeley also has a wonderful emporium in York. After success with her first fairs, Keeley decided to launch a specialist wedding fair so that brides who love the look can find everything for their special day including: more than 400 wedding dresses; antique lace; 30’s and 40’s lingerie; classic suits; jewellery; hair and make up advice; cars; specialist entertainment; cakes; floral displays and decorations. We’re really looking forward to meeting some of the makers of these wonderful things. The new brooch bouquets should provide a fitting addition to your vintage-inspired or influenced wedding day – this is their first outing to a fair so it will be fun to see what people think. Here’s a sneak preview of a couple of new designs that we’ve just created. There’ll be lots of colour, as well as traditional ivory favourites, and they are all packed with drop-dead gorgeous pieces of jewellery, beads, buttons, feathers, lace and more. No two bouquets are ever the same and each one takes many hours to create. You’ll certainly stand out from the crowd. Even better, you can keep them forever to pass on to the next generation! For further information, check out The Vintage Wedding Fair website. Look forward to seeing you there! Guests from further afield can struggle to find your Scottish wedding venue, so how about a custom wedding map? Cute Maps are a new twist on wedding stationery that’s both practical and pretty! They’re designed by artist and illustrator Sheree Hutchinson, who first came up with the idea when planning her own wedding. She says she was on a modest budget, but wanted something with more individuality and personality than an ordinary route map. Cue the first Cute Map! Sheree went on to launch her website, and her funky, friendly Cute Maps were an instant hit, with orders coming in from destinations as far afield as Austria, Australia and Beverley Hills, as well as places all over the UK. Each one is personalised to the individual couple and the occasion, whether it’s a wedding, birthday or other celebration. Her whimsical illustrations pick out local landmarks and can also add adorable romantic touches that help to tell the couple’s story. No two are the same, and they make a lovely keepsake. Cute Map designs are versatile, and can be sent as Save the Date postcards, invitation inserts or even the invitation itself. You can order printed cards, postcards or magnets, or simple order the design and use your own creativity! Some of Sheree’s clients have used the designs on posters, signs, stickers and even tote bags – the possibilities are endless! Click for more fun ideas and personal touches for your wedding from Get Knotted. Natural flower petal confetti is hugely popular with Get Knotted brides, and Shropshire Petals are especially close to my heart, as they come from my home turf! What’s more, they’re offering Get Knotted blog readers a special deal of £65 for two of their lovely Shropshire Boxes (see pic below) if you mention the discount code GN2011 when ordering. This is a special ivory dispensing box with 25 floral embossed confetti cones and 2 litres of delectable natural confetti of your choice. The box is tied with satin ribbon, and makes a great keepsake for wedding memories and photos! Shropshire Box of natural wedding confetti - special Get Knotted offer of 2 for £65 if you mention discount code GN2011! They’ve also just launched a new range of exclusive colour confetti cones, which come in white, pink, blue and green, and are embossed with the Shrophire Petals flower, giving a lovely texture to the confetti cone. 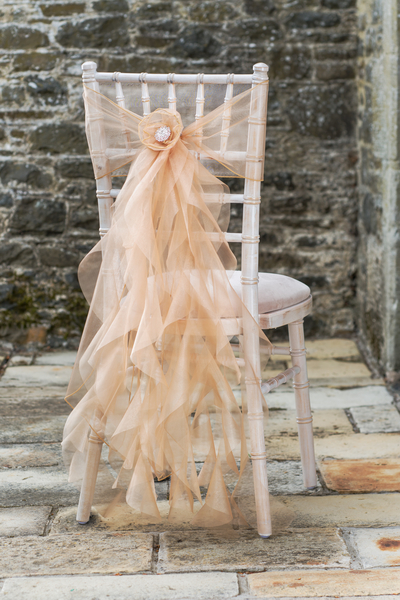 They’re perfect for any wedding theme, from an English country garden to chic Tiffany blue colour schemes. Shropshire Petals offer a great pick & mix service, so you can choose colours to fit your own scheme and theme, whether it’s deep red roses, tangy clementines or fragrant lavender. Or you can go for their seasonal mix of the month, such as this ‘raspberry fool’ of hot pink delphinium petals, green hydrangea and yellow rose – so pretty, and would look great decorating your party tables, too! And there’s a special price of £50 for Get Knotted blog readers – just mention the code GN2011. Shropshire Petals wedding confetti Mix of the Month - Delphinium and Rose/Hydrangea petals, 5 litres for £50 - just mention discount code GN2011! You’ll also want to check out the Shropshire Petals Fields of Ideas page for inspiration and beautiful photographs of petals used in different imaginative ways – for table settings, as dessert and cake decorations, and as an extra-romantic bath fragrance! Do also look out for the cute presentation and keepsake boxes, handmade confetti cones and wheatsheaf decorations in their their online shop. It goes without saying that all Shropshire Petals confettis are 100% natural, biodegradable and eco-friendly, and the site gives guidance on how much to order, and various packaging options. Visit the Shropshire Petals website for more natural confetti ideas. Jukebox Hire for weddings – Vintage Music on Tap! Before your (and my) time perhaps! But how about hiring your own wedding jukebox to help you and your guests re-live whichever musical eras you’re crazy about? We have added another service for our wedding clients at Get Knotted and teamed up with the phenomenally successful Betterdaze Juke Box Parties who supply historic jukeboxes from the 50s through to the 70s, together with the biggest collection of vinyl singles (remember vinyl?!) in the UK. We are now able to supply wedding venues all over Scotland. They are perfect for a vintage wedding theme and create a really fun talking point. We’ll fill the jukebox with all your favourites hits and requests and you can have dedications written against particular songs for an extra personal touch. It’s guaranteed to get the after-wedding party going with a swing. Choose from music from the 1950s through to the mid-1990s – so anything from Andy Williams to Robbie Williams – and you can get friends and family involved by asking for suggestions and favourite songs. There are five different models of the famous Wurlitzer 1015 Dometop Bubbler, which holds 100 7-inch singles, giving you a choice of up to 200 songs from an amazing 30,000+ originally vinyl singles from the last 50 years. For true vinyl buffs, there are also rare records from non-chart artists, including American rock-n-roll and European rock. And if you’re overwhelmed by the sheer choice, we can help out by recommending records around your chosen theme. Maybe a chance to indulge your passion for Northern Soul, 70s Disco, or punk bands?! The great advantage of your own jukebox over hiring a DJ is that it’s yours for the whole day and into the night if desired and you have control over the volume! So if you’re planning to party into the wee hours, this is perfect! Great fun, and a style icon of music history that will get the generations talking! Feeling groovy? Try these GK site searches for more fun wedding ideas, vintage wedding inspiration and wedding prop hire for Scotland and the north of England. Visit the Betterdaze website for more on vintage music hire for weddings.